Mussels are one of the seafood varieties that I have mixed feelings about. I like them, but I don’t really have the confidence in preparing them to serve them at home very often. I know it’s not all that difficult, but something about those closed shells makes me a little wary. Of course, in this area, they’re one of the cheapest seafood options around. I can buy a two-pound bag for around $6. Six dollars in other seafood might yield me three shrimp, a chunk of crabmeat the size of your thumb and two scallops. Not exactly enough to make a meal for two. Getting tired of eating the same thing over and over again, I decided to bite the bullet and pick up one of those bags of mussels on ice that always called to me from the seafood area of Wegman’s. 1. Fill a large bowl with very cold water and place the mussels inside. Allow them to sit for 10 minutes, then use a slotted spoon to scoop them out onto a large baking sheet. 2. 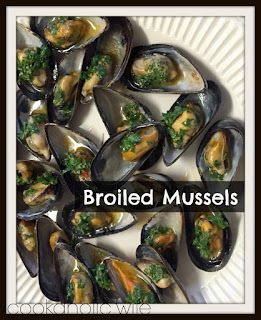 Discard any mussels with cracked or chipped shells. If the beard of the mussel still remains, pull it off, pulling toward the hinge of the mussel. 3. Fill a large saucepan (I used my Dutch Oven) with the wine and bring it to a boil. Use the slotted spoon to transfer all of the mussels into the saucepan then cover. 4. Shake the pan to stir around the mussels every minute or two. Start checking for opened shells after 3 minutes, but it can take up to 6 minutes before they open. After 6 minutes, remove them from the heat and allow them to cool. 5. Meanwhile, mash together the butter, parsley, garlic, smoked paprika and salt together in a bowl until combined. 6. 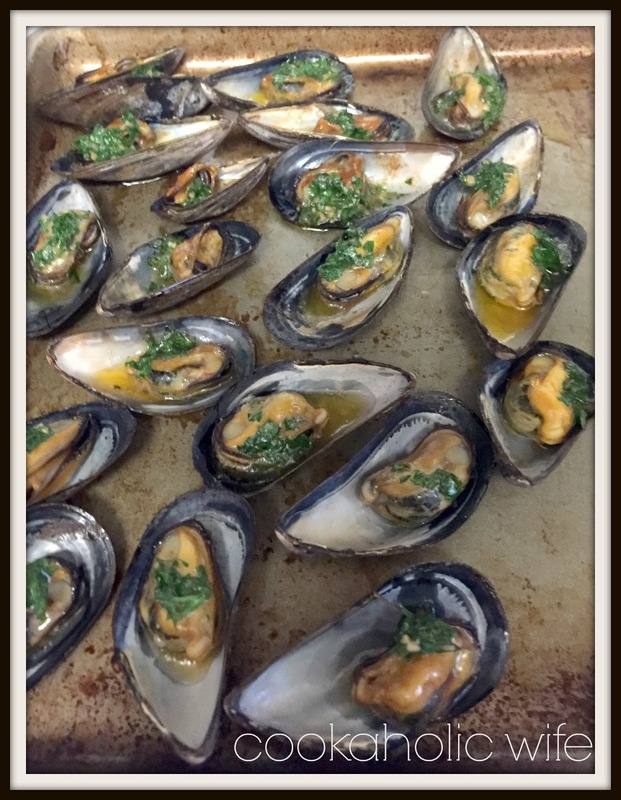 Pull apart the mussel shells, placing the shell with the mussel on a large baking sheet. Discard the other half of the shell. Also discard any mussels that did not open. Repeat with all remaining mussels. 8. To serve, preheat the oven to 500 or broil. Cook (or broil) for 2-4 minutes until the butter is melted and bubbly. Serve immediately. If you can’t purchase mussels the same day you plan to cook them, put them in a bowl of ice in the fridge for up to 3 days, changing the ice daily. Soaking the mussels in cold water gets them to expel their sand. Scooping out of the water wit a slotted spoon allows the sand any other sediment to fall to the bottom of the bowl, not get stuck to the mussel again. Any mussels with cracked or chipped shells need to be discarded immediately. Same goes for any that have already opened before the steaming process. Pulling the beard off the mussel in the opposite direction of the hinge can kill the mussel. Always pull toward the hinge. It does require a good yank! These were so good! The most common way to serve mussels is in a wine sauce with bread, so if you saved the wine that your steamed them in, you could easily warm it back up and serve these along with slices of crusty bread.